A current, prevailing worldview is that everything and everyone can be categorized as a particular type. Each of us—plant, animal, or human—can be classified within a system of limited possibilities. Based on this belief, all of us humans are hungry to know who we are and how we fit into our time and place. We so eagerly want to know what types of lovers, wives, parents, or men we are that when magazines promise us quizzes to sort ourselves out they quickly disappear from newsstands. This helps us identify ourselves, and it may seem to help us understand nature and other beings. But despite its allure, by itself it cannot give us real knowledge. On the other hand, we hate it when we are compared to a specific other person or when our situation is described as a generic example of things as they are. We love the idea that no two snowflakes are alike. We know from genetic science that there are no combinations that repeat. Nature does not create exact duplicates. From microbe to baby deer to human brain, every particular example of each life form is unique. To overcome confusion about the degree or quality of likeness and difference among living beings requires discernment developed over time. It is true that based on surface characteristics, a person, a tiger, or a watershed is not unique and can be identified and categorized according to rating scales similar to the ones we enjoy reading about in magazines. 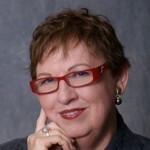 Personality characteristics and personal strengths are easily organized into typologies. Nevertheless, at our cores each of us is singular, and every whole, living being has an essence that is permanent, not an accident of birth, and not the result of socialization. This irreducible reality is captured in the root meaning of essence, which is not to become something, but to be something. Why Does Essence Matter to Business? In the business world, we have a firm grasp of differentiation, which is often the basis of branding. A truly great business—one with a long and consistently creative life—goes beyond differentiation to essence or singularity. It becomes aware of its unique identity early on and adheres tenaciously to it over the long-term; it hires to preserve it, develops products and services that express it, and makes it the basis for orientation and development. Singularity is the source of disruptive innovation, and a wise business jealously guards it. Yet even so, a great business often does not express equal understanding of singularity with regard to people and natural systems. Advocating or advising from ideals of any kind interrupts essence expression. Ideals arise from societal or cultural aggregations of assumed truths. We form them in order to corral people who seem to be wandering beyond the bounds of accepted society. In other words, we use them to standardize norms, to make people all alike so that we can predict and control their behaviors. The imposition of ideals to for the purpose of dominating is not only characteristic of our relationships with children. We extend it to everything alive. John Mohawk, a tribal elder and a professor at New York University, has said that “ideals are how one culture eradicates another, as the Europeans have come close to doing with the Native People’s of North America.” Within the context of standardized identity, people learn to normalize themselves by mimicking others. In the business world, this can show up as the imitation of products or approaches that belong to other companies’ brands, a symptom of the failure to identify and adhere to singularity. And because we have spent so much time collecting and organizing ideals, standards, best practices, competences, and categories, most of us haven’t learned to recognize and value singularity in any aspect of our own businesses. In a regenerative process we look for singularity not in existence, but in potential. I love to suggest that the essence of the IRS is not collecting taxes. That is only a surface. At its founding, the IRS was intended to increase the wealth-producing capacity of citizens and fund the agreed-upon costs of existing as a nation. How would our relationship with the IRS change, if we were able to see through to that essence? How would the IRS work with us if they were able to hold in mind their unique identity? Would the nation ever experience a shortage of revenue? I suggest that every one of us living in the United States would be wealthier and probably happier. It isn’t easy to see the essences of people around us because they are often obscured by the challenges of family, school, and work life. When people are persuaded to conform, their essences are overtaken by personality traits, and the characters they play take center stage, nudging out their true selves. In order to develop the capability to recognize and engage with essence—our own and others’—we must hold it in mind and pursue its living expression in all of our efforts. Every watershed, community, and business has an essence. No two businesses are alike, although at a functional or object level (as with personality in humans), they may share many traits. We may classify types of employee, natures of raw material, categories of business plan, but until we take the time to know people, materials, and systems as their singular selves, we are failing to know and nurture them in the same way we fail to know and nurture a child when we exhort her to be like her father. A regenerative view of the world sees phenomena not only as dynamic, but as singular. That is, instead of categorizing, identifying, and grouping according to what things have in common, a regenerative business always seeks to discern the essence that makes each thing distinctly itself. 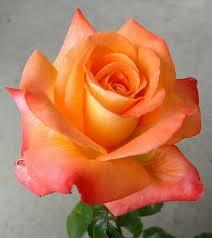 It accepts and welcomes the realization that each expression of being is one of a kind. This ability to appreciate singularity becomes the basis for deep creativity and motivation, a diametric opposite of the deflating belief that everything has already been seen and done by others before us. It requires constant resistance of the tendency to categorize and pigeon hole. Instead it seeks to see each phenomenon, each customer or retail location or product, as unique and new and deserving of our full presence and attention. Looking to existence, writing down our observations or collecting facts, will not reveal singularity. In order to sniff out essence, we must become trackers and look for it in the same way that native peoples follow the traces of animals who have passed by. Essence becomes apparent in the patterns that are specific to a person, those that reveal how they engage with the world, their purpose in life, the unique value they create as the result of their endeavors. The same is true for the essence of any natural system, community, or organization. 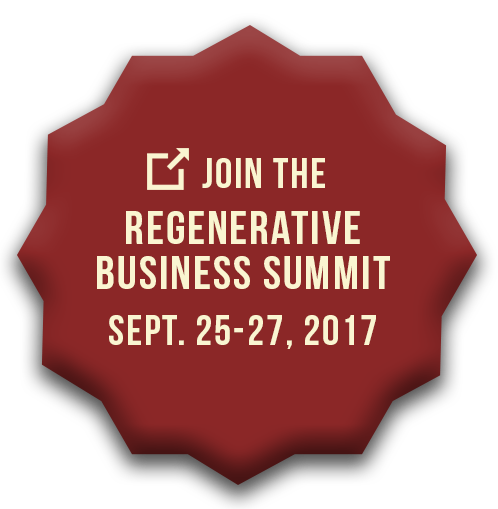 To accelerate the conversation about regeneration and its seven principles, The Regenerative Business Summit will bringing together 200 edge thinkers who are seeking to co-create changes in businesses, industries, societies, and movements. The Regenerative Business Alliance will provide the platform and the structures for dialogue; it will also award The Regenerative Prize as a means to identify more edge thinkers. Products of the summit may include further projects and the publication of papers, as decided upon by participants.